Birdsey Hall was built in 1810 by Birdsey Norton who, in his travels to the south as a cheese merchant, was impressed by the mansions he saw and resolved to build one in Goshen. The main house is built of red brick made from Goshen clay and is decorated with marble from nearby Norfolk. 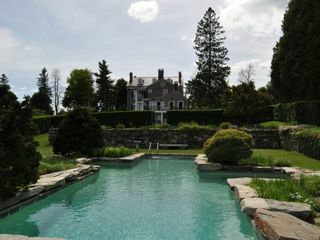 Later in its life, it was owned by Liberace's long term friend, Fred Favorite. 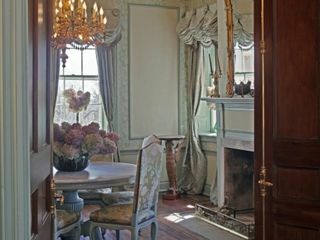 Many in town think this ownership was a beard and the house is referred to by locals as "Liberace's House". 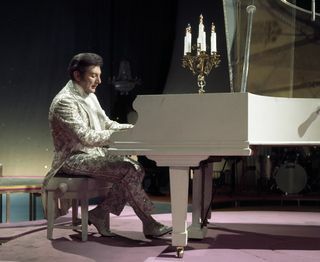 We were told that Liberace visited the home frequently and kept a piano there. Much to our surprise, Thomas Catlin Easton, read our recent Facebook post and added to the history of the house. "The Steinway was in the Northeast corner of the first level of the original building. If this was it, then it was there right where the round table is. I got to meet, have breakfast with, and hear Lee play that piano back in 1979. Fred Favorite and Bob DeVoye were friends of mine and I got to live at the house while they were away producing a musical in NY state. Oh the stories to be told... "
The photo at right shows where Liberace's Steinway was at that time. He added, "Another note: Lee had a pristine Dusenberg (or some such) in the garage under the breakfast room (checkered marble floor off the kitchen). Bats used to fly down the flu in the master bedroom and we had to use a tennis racket to corral them! Singer Sergio Franchi stayed there when he would play at the dinner theater (I forgot the name). Thanks for the memories! Lastly, the house was on the Underground Railroad, is just down the road from Abolitionist John Brown's birthplace, and Harriet Beecher Stowe was born further down the road in Litchfield"
To add some more color to the story, Thomas shared, " Finally, Lee, Fred and Bob had closets and the attic full of rather outlandish (but real) costumes from various shows. Lee's bedroom was painted powder blue (his favorite color) and, just between us, he wandered the house in white fur muck lucks and a red, white fur-lined bathrobe. He also had an absolutely beautiful, functioning, extremely old harpsichord in the room opposite the music room. OK, that's it!" Call or Email: Stacey Matthews: 860-868-0511 matthews@raveis.com to request more information.